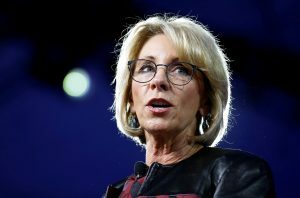 Of the roughly 16,000 fraud claims approved thus far by the Education Department under DeVos, slightly more than 1,000 students received full forgiveness on their loans. More than 9,000 loan forgiveness claims have been denied under Education Secretary Betsy DeVos, according to the data. Left: U.S. Secretary of Education Betsy DeVos speaks at the Conservative Political Action Conference (CPAC) in National Harbor, Maryland, on Feb. 23, 2017.